Bali is referred to as the Island of the Gods and is renowned for its highly developed arts, including traditional and modern dance, sculpture, painting, leather, metalworking, and music. It is one of the world’s most popular island destinations with its beautiful beaches, a plethora of cultural, historical and archaeological attractions, and a wide range of accommodations. In fact, the tourism makes up 80% of its economy. Bali is rich in natural beauty, with attractions for every kind of traveler. Here are the top places to visit in Bali. Sekumpul Waterfall is considered by many to be Bali’s most beautiful falls. It is a series of about seven falls in the Singaraja region in the north of Bali. Going to the Sekumpul Waterfall is a great adventure for nature lovers who want a taste of wild Bali far from the touristy resorts. It takes a four-hour round-trip trek to reach the waterfalls. With a local guide, adventurers will pass by picturesque rice terraces, local villages, and dense tropical jungle. Once you reach the falls, you can cool off by taking a refreshing swim at the base of the falls. Ubud Art Market is locally referred to as ‘Pasar Seni Ubud’. 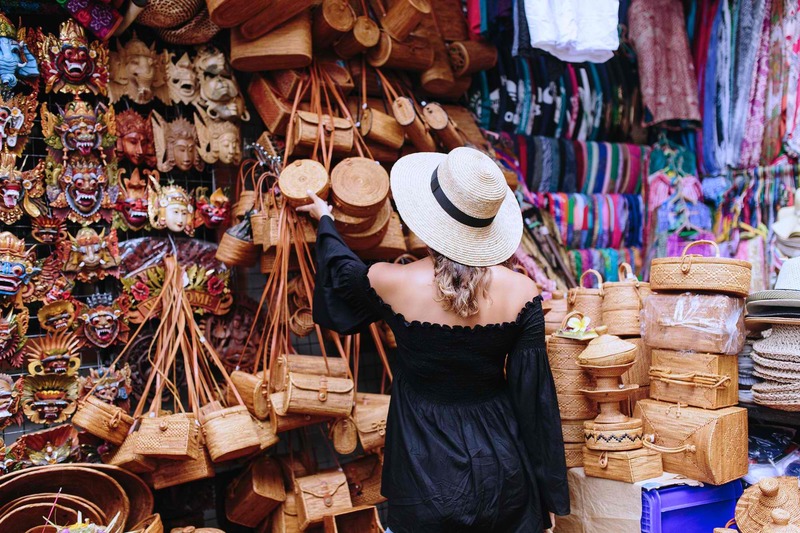 It is the perfect place to buy the renowned hand-crafted goods and souvenirs in Bali, such as handmade woven bags, statues, hats, baskets, jewelry, paintings, homewares and beautiful silk scarves. The Ubud Art Market is strategically placed at the center of art-producing villages. Most of the goods sold at the Ubud Market are made in the neighboring villages of Payangan, Pengosekan, Peliatan, and Tegallalang. The Ubud Monkey Forest, which is only a ten-minute walk from the town center of Ubud, is one of the top places to visit in Bali. It is also known as the Sacred Monkey Forest Sanctuary and is a must-see for animal lovers and photographers. 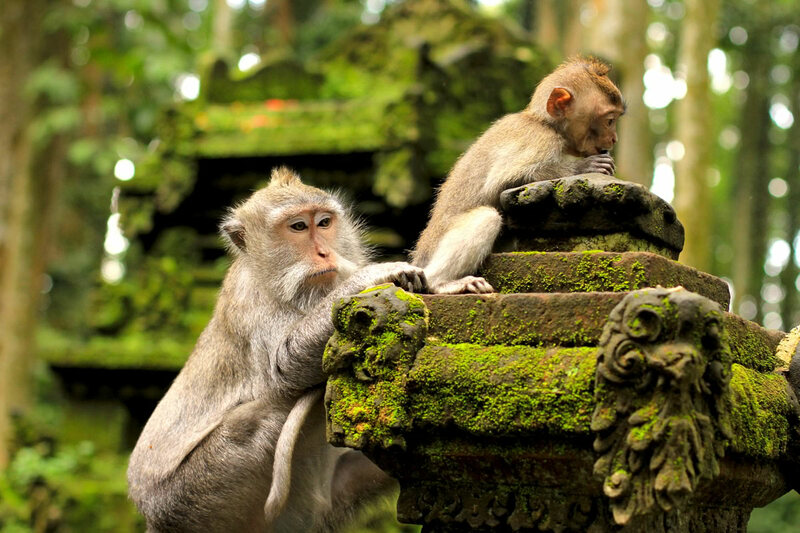 Ubud Monkey Forest is a natural forest sanctuary which is home to a horde of grey long-tailed macaques. Aside from the monkeys, the sanctuary also features beautiful ancient temples with moss-covered statues. The Pura Dalem Agung Padangtegal in the southwest and an ancient bathing temple called Pura Beji in the northwest. About an hour’s drive from Ubud is one of the top destinations in Bali. Mount Batur sacred active volcano lies in Kintamani District in Bali’s central highlands. 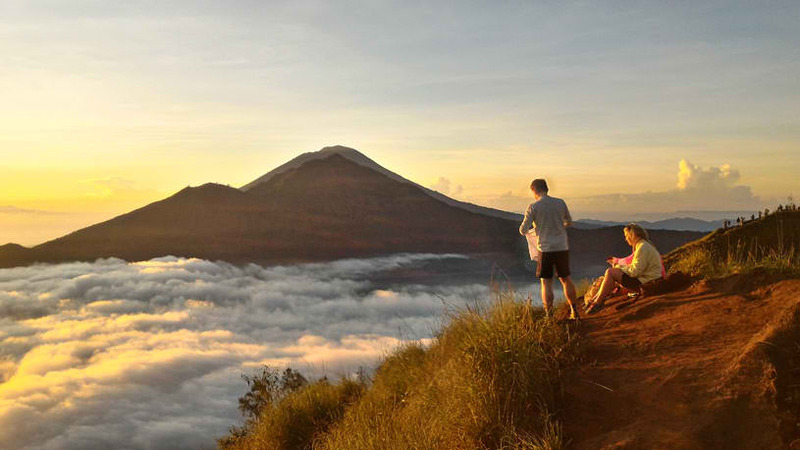 Every day, hundreds of visitors begin the trek up the 1,700-meter summit of Mount Batur to watch the sun rise and the spectacular views of the surrounding mountain range, Batur caldera, and Lake Batur, which is the island’s main source of irrigation water. The hike along the well-marked trails is relatively easy and usually takes about two to three hours. These are only some of the top destinations in Bali. You have so much more to discover in quintessential paradise. Whether exploring the distinct culture of the Balinese people, visiting iconic temples, climbing an ancient volcano, shopping at the art market, scuba diving in coral reefs or sunbathing on the beach, Bali has a bit of paradise to offer everyone.